(Irish: Fearna, meaning "alder trees" short for Fearna Mór Maedhóg) is a small historic town in north County Wexford, Ireland with a population of about 900. It is 16 km from Enniscorthy, where the Gorey to Enniscorthy N11 road joins the R745 regional road. 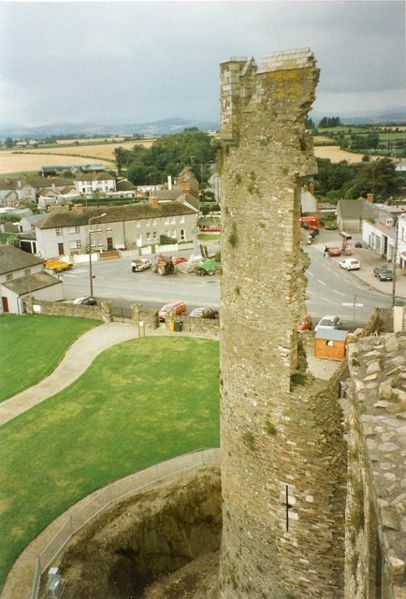 The ruins of Ferns Castle are in the centre of the town. Ferns is believed to have been established in the 6th century, when a monastery was founded in 598 dedicated to St Mogue of Clonmore who was a Bishop of Ferns. The town became the capital of the Kingdom of Leinster when the kings of that southern part of the province established their seat of power there. The most notorious of these was Dermot MacMurrough who is forever associated with inviting the Anglo-Normans to Ireland in 1169. Ferns Castle, an Anglo-Norman fortress, was built in the 13th century by William, Earl Marshall. Today about half of the castle still stands. Several other reminders of the town's eventful history include St Mary's, a 12th century Augustinian priory established by McMurragh circa 1160 and where he is thought to be buried. The town also contains the 13th-century St Edan's Cathedral (Church of Ireland) and several high crosses and parts of crosses. The town gave the name to the Diocese of Ferns (both Roman Catholic and Church of Ireland). The town's religious traditions live on today through the recent establishment in Ferns of a heritage centre.. Ferns railway station opened on 16 November 1863, closed to passenger traffic on 30 March 1964 and to goods traffic on 3 November 1975, before finally closing altogether on 7 March 1977. The Bus Éireann Dublin-Rosslare Europort service passes through the town. Anne Doyle - R.T.É. Newsreader. Dermot MacMurrough (d. 1171) - former King of Uí Cheinnselaig and Leinster. Gordon D'Arcy professional Ireland and Leinster rugby player. Most often playing at inside centre. Edward Walsh (hurler) former minor intercounty hurler. Once scored 2-12 in a hurling match. Joe Breen starred as young Frank McCourt in the film Angela's Ashes. Paul McGrath, Ireland International soccer player.